Often, we use internal surveys to gather and compare management’s attitudes and opinions regarding a number of different topics — what does the company need to do differently to improve current sale performance, does the company need to change its strategy to counteract competitors’ threats, etc. Sharing different views and opinions is helpful to come to a common understanding on issues and directions before an improvement project is started. Internal survey results can also be compared to peer group responses that we accumulate for benchmarking purposes. 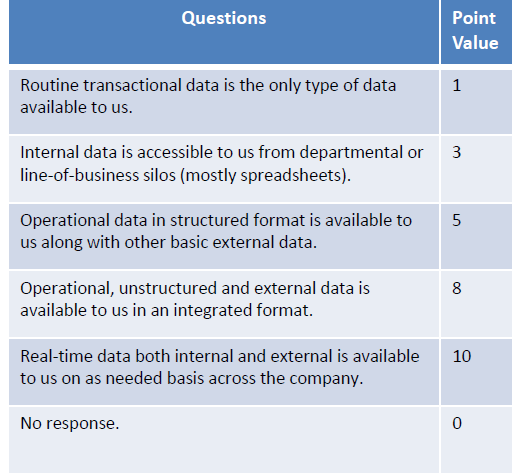 The question block above is one of the ten questions we use to evaluate a company’s use of analytics in making business decisions. Each question is asked, response is scored and the total points are compared to a peer rating table. In this example, the rating is used to identify the company’s level of maturity in terms of using business analytics. A company’s maturity can range from Analytically Challenged to Competitively Analytic. With these comparisons, a company is better able to direct corrective efforts at the right deficiencies or problems. In other words, benchmarking helps the CEO decide where to focus the company’s efforts. We also use external surveys to gather insights from a broader audience than the internal staff. For example, we may ask executives to provide their views on the rising level of business complexity, the need to make decisions based on more than gut feel and hunches, or the extent business analytics is used in their organizations. The capability to gather and use this data to make better informed decisions is one of the deciding advantages any company has over the competition. Our surveys are intended to shed light on topics that are important to a company’s growth and prosperity. The survey helps to surface thoughts and discussion — What about the data itself: is it reliable, accurate, etc.? Is the company settling for what is available because it is easy? Is the company measuring what matters? Of the data available, are the right questions being asked? What would improve the confidence level? More data? Better data? Better analysis techniques? These are important questions in using analytics to improve company performance.